The first issue of my new school-set comedy comic. A5 sized, 24 pages. Black and white with colour covers. Heavens, it’s been a year since we last reviewed something new by Rob Jackson. I knew it had been a while but hadn’t realised it was this long. Jackson, for those who don’t know, is something of a old-timer in the Brit comics scene. There’s definitely a sense of a comic maker driven to make, someone very much settled into an artistic style, something deliberate, defiant even about the crude style. But the important thing to realise is that Jackson’s stuff is just damn good, unexpectedly good even. For a start there’s all that chopping and changing of subject matter, the autobiographical tales of Jackson’s ice-cream business or his family’s past, the almost classical comedy of errors of Goblin Hall, the fantasy of Flying Leaf Creatures, the surrealist laughs of The Gods Are Bastards, the creeping dread of California, the comedy sci-fi of Segway, hell, every new comic is an adventure, and the first adventure is always what the genre is this time round. Then there’s the excellent storytelling going on. He’s invariably got a damn good story to tell and he invariably does it really well, the artwork might be unfussy, the stories certainly aren’t, with even the most grounded of tales having something beautifully off-kilter about them. Oh, and then there’s Jackson’s grand sense of humour, always there, very dry, oft times verging into the surreal. All in all, his comics are a treat. 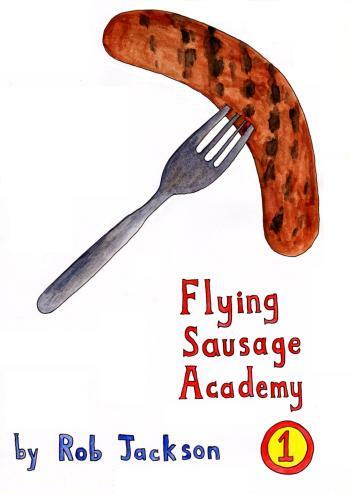 Flying Sausage Academy certainly didn’t let me down. A cover to make you wonder, the first page reasonably normal enough, could come straight from any teen high school TV show, parent dropping rebellious teen outside new school, dire warnings not to screw it up and get expelled again, all normal. Yes. King Penguin. Bully, extorter, boy with a penguin head. You see what I mean about Jackson’s ability to drop this stuff in without missing a beat? From here it all gets stranger, Flying Sausage Academy (well, Finchley Special Academy, but kids and their nicknames…) is full of weird normality. The different tribes of kids are all here, including those kids that stand out from the crowd a little, then there’s the teachers with their various quirks, the headteacher a nice eccentric perhaps. It’s all very a very familiar, very old-skool school tale. Sausage Academy is 24-pages of b&w school story with a very Rob Jackson touch. The future promises more school japes, more quirky teachers and unusual pupils, a mystery of Daryl’s bed-bound and hidden mum, and a headteacher’s mission for young Daryl. There’s a load of reading in here, a load of fun, Jackson’s work dense but eminently readable, the art takes some getting used to sure, but like I said, the storytelling, plots, humour, dialogue, all of those are so well done. Give it a try, you’ll not regret it. Here’s a review from Rob Clough at his ‘High Low’ site.